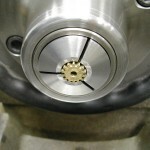 First the gear is placed in the collet. 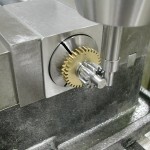 Then a parallel or other flat piece of metal is used to push the gear flush with the face of the collet and hopefully, the bore parallel to the spindle axis. 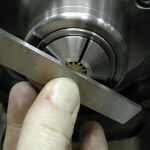 If I didn’t have a boring bar small enough, or the size difference between the old and new bore wasn’t very great, I just stepped up through reamers by 1/32″ until I reached the finished size. For large changes in diameter, boring was the answer and carbide endmills make great small boring bars! 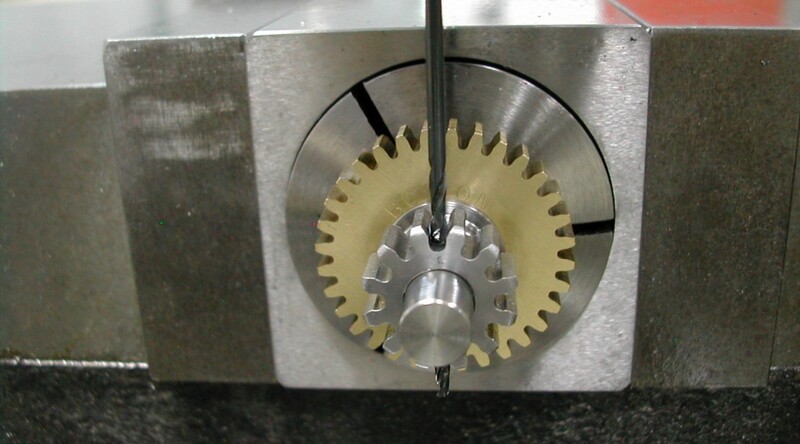 With both gears bored, it was a simple matter to press them onto the jackshaft. 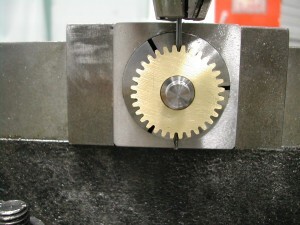 I tried to press both gears on with one tooth root aligned to help with timing the cam later. 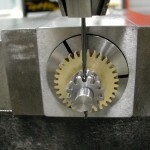 After pressing the gears on, it’s over to the mill to drill and add the 1/16″ roll pins. 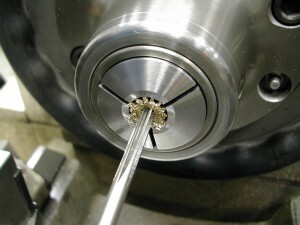 With the jackshaft in a 1/4″ collet and a square 5C collet holder, I’m locating the center of the jackshaft. 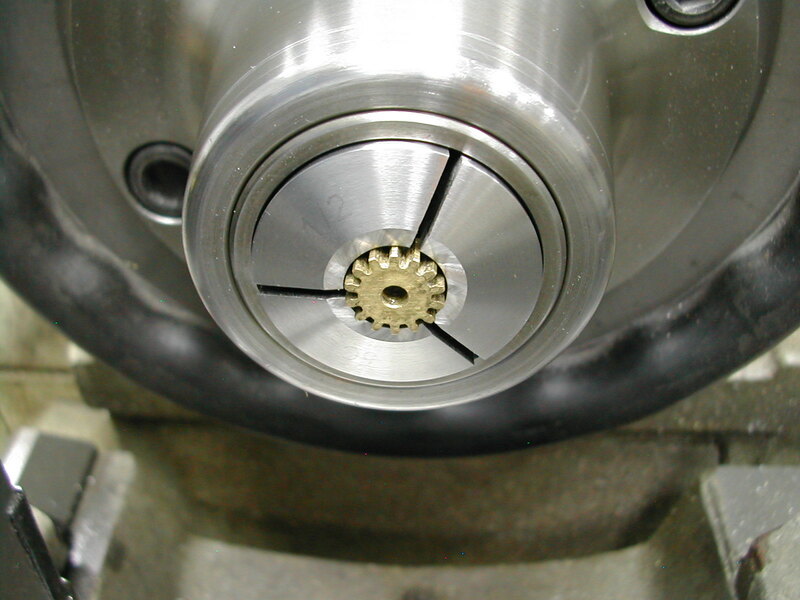 With the spindle on center and the collet slightly loosened, the jackshaft and gears are rotated until the spindle is centered between two teeth in the tooth root. 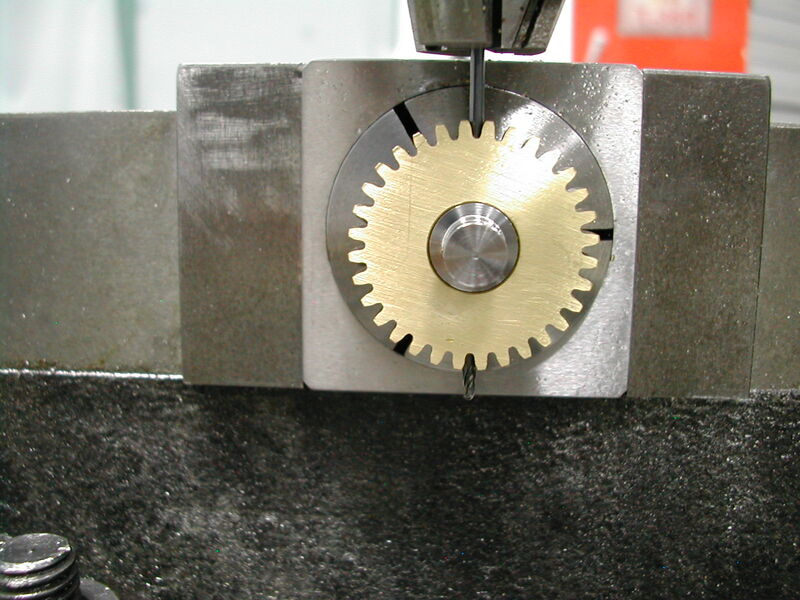 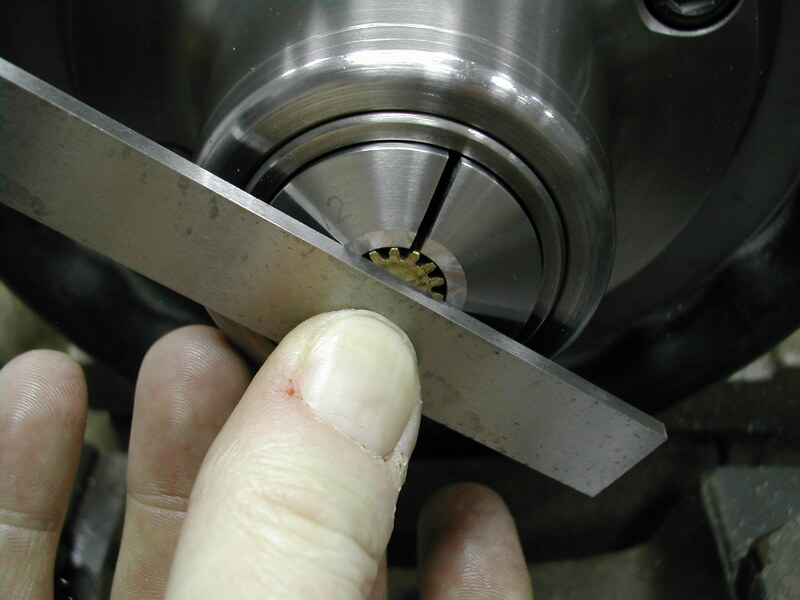 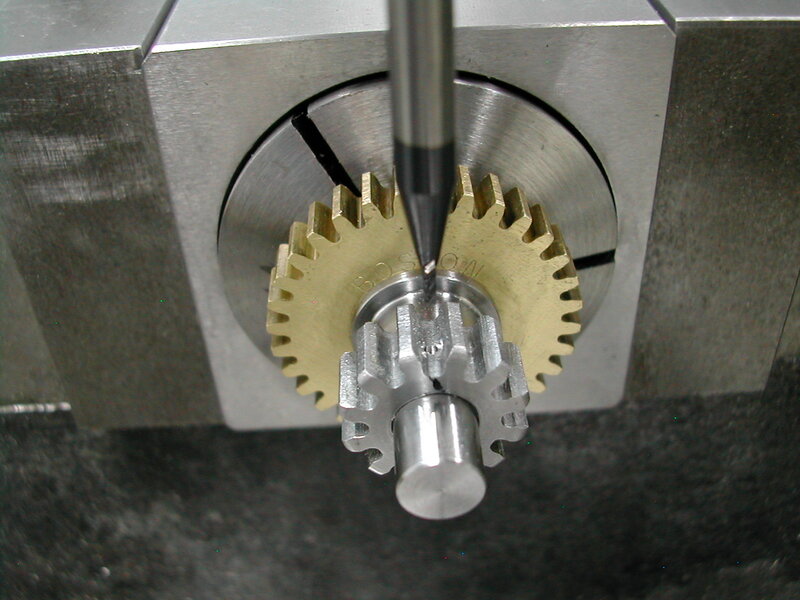 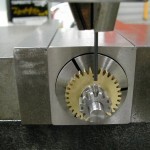 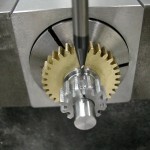 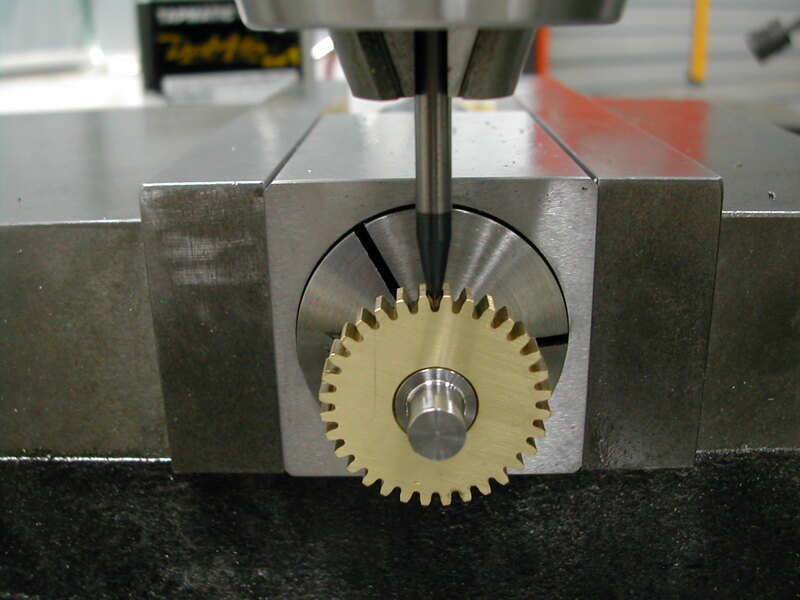 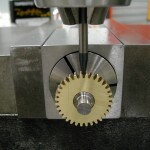 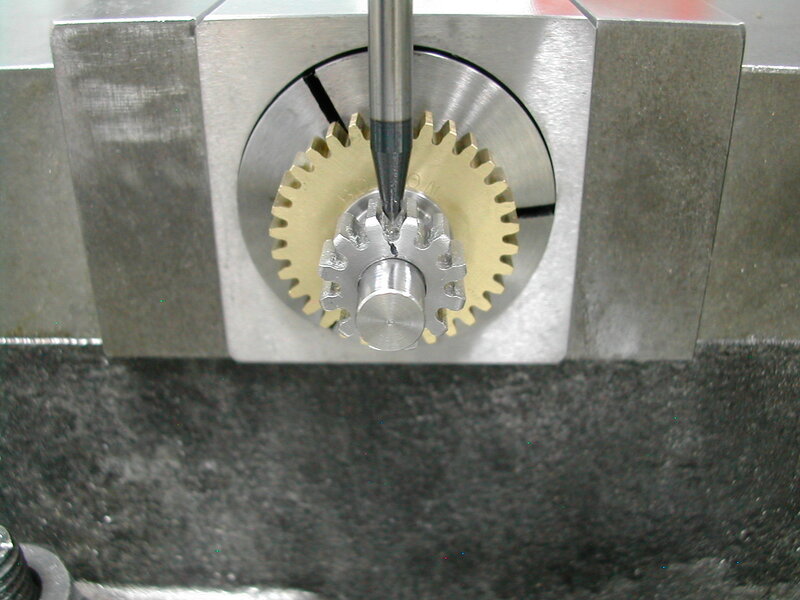 The collet is tightened and the table is moved so the spindle is in the center of the gear face. 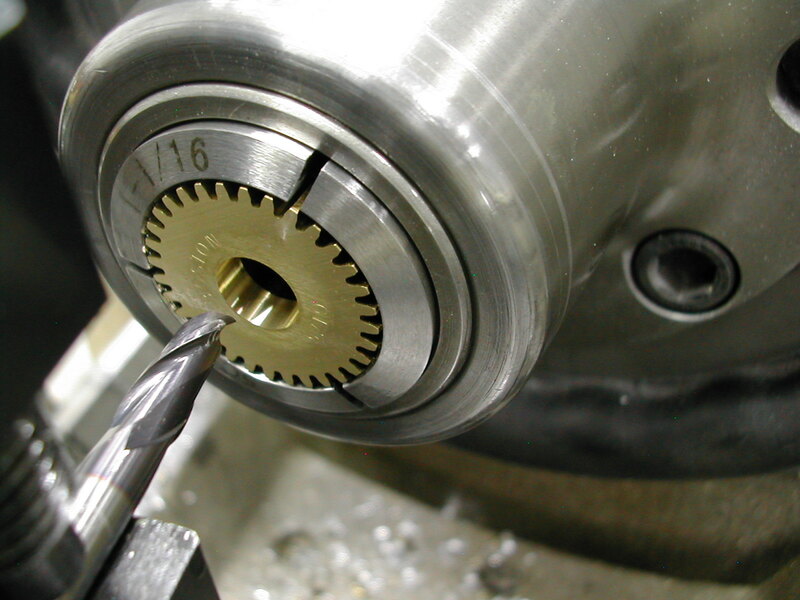 Next, I used a 1mm carbide endmill to create a starter hole since I couldn’t get a centerdrill in there. 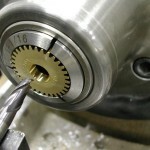 Finally, I drilled with a 1/16″ drill bit through. 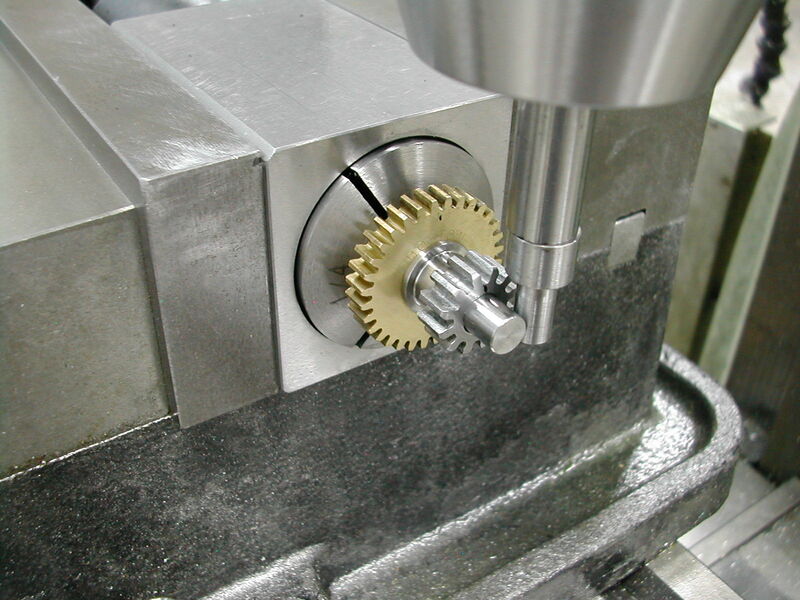 The drill bit turned around in the chuck makes a good drift to press the roll pin home. 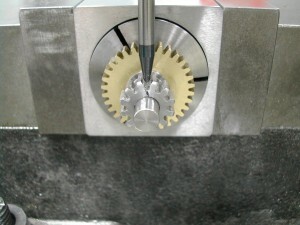 Try to center the roll pin in the gear to maintain balance. 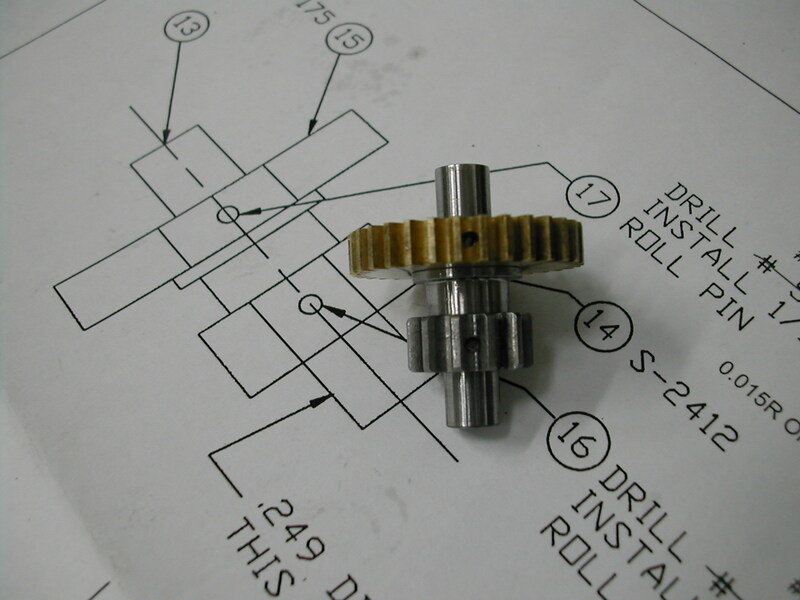 Flip the jackshaft around in the collet and repeat the alignment process for the brass spur gear. 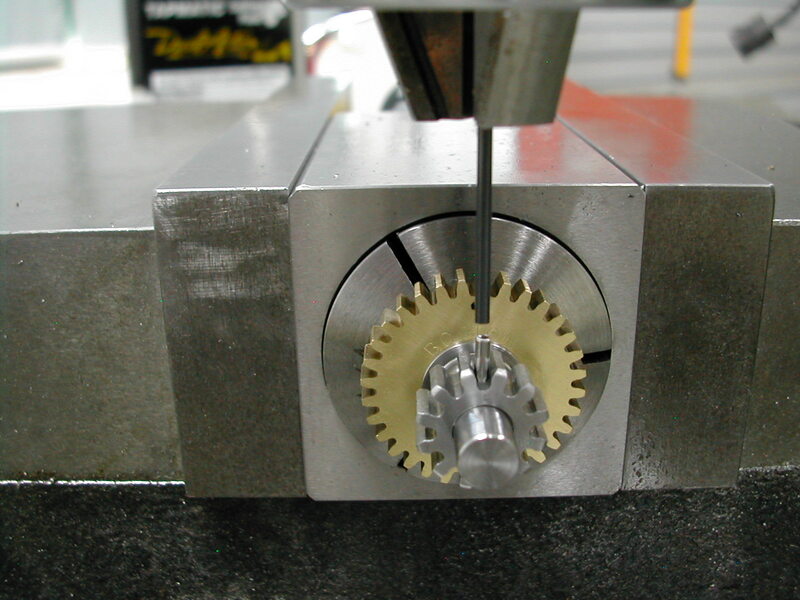 Repeat the clearance and hole starting operations with the endmills, and then drill this side through. 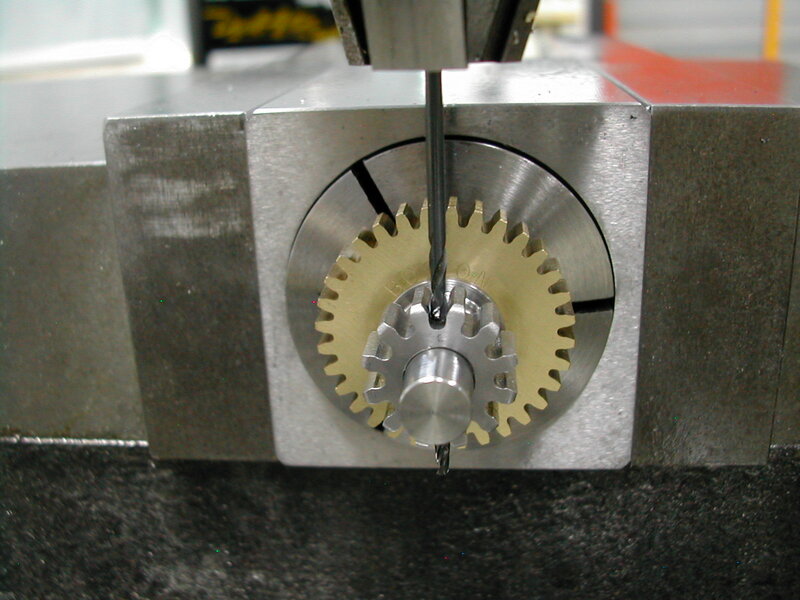 Press the roll pin using the same process as well, again centering the roll pin in the gear. 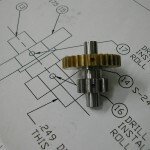 One jackshaft ready to be installed in the cam assembly.